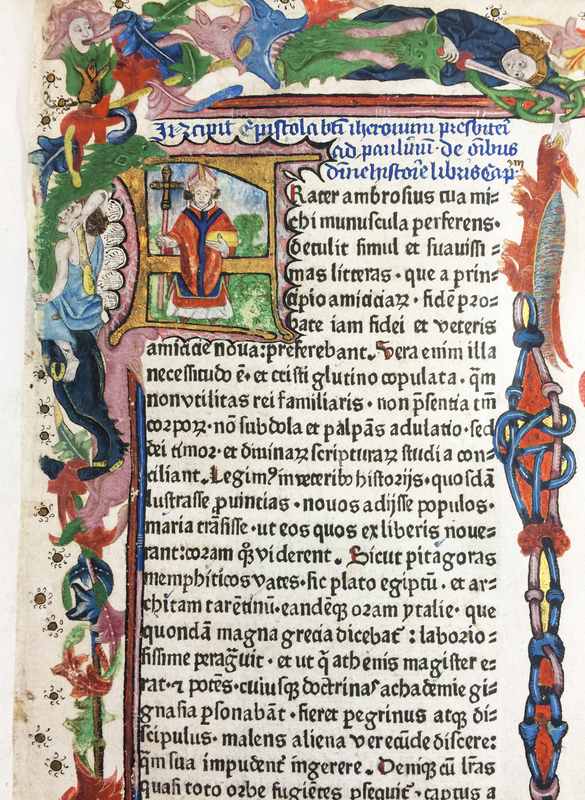 Provenance: Benedictus Elwanger. — Monastery of St. Wulfgang, Retfelt. — Carmelite monastery, Schongau. — Johann Georg Einslin. — Morris. — Richard Bennett. — J. Pierpont Morgan. — Morgan Library (ChL528). References: Ellis valuation, fol. 29 (£5). — ISTC (ip01046000). — Morgan Catalogue 1, no. 215. Epistolae et Evangelia (Plenarium). 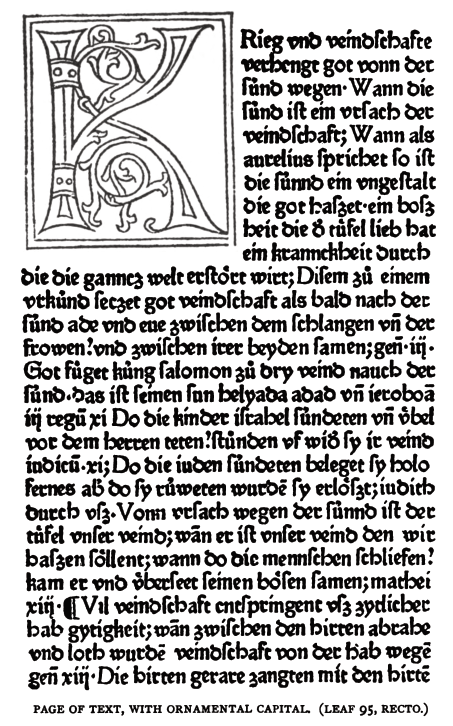 Augsburg: Johann Bämler, 20 September 1474. Provenance: William Bateman. — Thomas Bateman. — Morris. — Richard Bennett. — J. Pierpont Morgan. — Morgan Library (ChL312). References: Ellis valuation, fol. 3b, no. 27 (£50). — ISTC (ie00073000). — Morgan Catalogue 1, no. 132. Bindo, of Siena [Bindus Guerri, Senensis]. Aurea Biblia, sive Repertorium aureum Bibliorum. Augsburg: [Ludwig Hohenwang, c. 1477] . Provenance: William Lilly. — William Stuart. — Morris. — Richard Bennett. — J. Pierpont Morgan. — Morgan Library (ChL352). References: ISTC (ir00021000). — Morgan Catalogue 1, no. 146. Biblia latina. 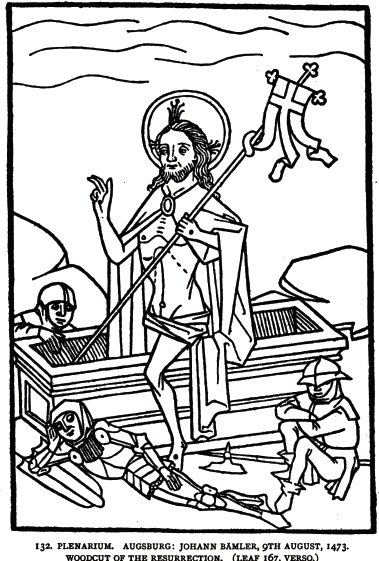 Nuremberg: Anton Koberger, 14 April 1478. Provenance: Edward Hailstone. — William Morris. — May Morris. — Oxford University [bequest of May Morris]. — Society of Antiquaries of London (MR 30d). Le premier [second] volume de la bible en francoiz. 2 vols. in 1. Paris: Jean Petit, 23 October 1520. Provenance: Cesar de Missy. — Robert Harley. — Morris. — Richard Bennett. — Sotheby 1898, lot 186 (sold to Leighton for £4). — Unlocated. References: Ellis valuation, fol. 20b, no. 259b (£2). — MS catalogue (2), no. 801 (with two X’s beside it). Note on flyleaf by Cockerell about the type. Provenance: Unidentified Cardinal. — J. A. J. Rotthier. — Morris. — Richard Bennett. — Sotheby 1898, lot 173 (sold to Quaritch for £13 10s.). — Quaritch. — General Theological Seminary [gift of Eugene Augustus Hoffman and Cornelius Vanderbilt]. — Christie (New York), 1 October 1980, lot 55 (sold for $12,000). — Bridwell Library (06123 and 06124) [purchased 1 October 1980]. References: Ellis valuation, fol. 27b (£ 13 10s.). — ISTC (ib00531000). Berjeau, Jean-Philibert, ed. Biblia pauperum, reproduced in fac-simile from one of the copies in the British Museum. London: J. Russell Smith, 1859. Provenance: Morris. — Richard Bennett. — Sotheby 1898, lot 188 (sold to Hill for 18s.). — Unlocated. Reference: MS catalogue (2), no. 312. Forshall, Rev. Josiah, and Sir Frederic Madden, eds. The holy Bible, containing the Old and New Testaments, with the apocryphal books, in the earliest English versions made from the Latin Vulgate by John Wycliffe and his followers. 4 vols. Oxford: Oxford University Press, 1850. Provenance: Morris (purchased for £3 3s.). — Richard Bennett. — Sotheby 1898, lot 90 (sold to Ball for £2). — Unlocated. References: MS catalogue (1), fol. 16. — MS catalogue (2), no. 703. Digital versions: Google (vol. 1; vol. 4) — HathiTrust (vols. 2–4).